The FA Cup is back for the new season, and I ventured to Congleton Town’s Richborough Estates Stadium for their Extra Preliminary Round tie with Nostell MW.The legend surrounding Congleton is that back in the seventeenth century the town, (notorious for bear-baiting and cockfighting at that time) sold it’s bible in order to purchase a bear. In truth they used the funds reserved for a bible to purchase said beast but either way it lead to the area being referred to by the name Beartown, and inevitably a nickname for the football club of The Bears. This is a blessing for lazy writers – the club’s nickname is perfect for transfer targets (Bear’s Hunt ‘X’), large victories (Bear’s Maul ‘X’), and even, heaven forbid, financial ruin (Bear’s Face Extinction). Even the legend lends itself to a football comparison – isn’t it the aim of any club to swap a mostly useless asset for a powerful, dangerous, crowd drawer? In the nattily named clubhouse The Bear Den prior to kick-off there is a congregation of Congleton fans dressed up as Scottish stereotypes in honour of their sides three Scott’s – Scott Sephton, Scott McGowan, and Scott Barlow – two of which shared three goals between them during the sides opening 4-3 North West Counties Football League game against Barnoldswick Town. There are kilts and ginger wigs and ‘comedy’ accents abound leading one suited gentleman to remark “Thank goodness our manager isn’t bloody Zulu”. Nope, me neither. Scott McGowan, is slight of frame and waspish to the point I half expect to see him leave the pitch completely to perch menacingly on the top of a spectating child’s can of fizzy pop. Michael Crosby is substituted through injury. The crowd of 163 seem almost within a drug induced stupor such is their dazed acceptance of what is being served. The slightly surreal sound of bagpipes echo from a dodgy speaker behind the away teams goal. The second half starts brighter than the first and with slightly more passion on display. The Nostell number two, Matthew Johnson, a square shaped Mr. Man of a fullback is booked fairly early on but the free kick comes to nothing. The chances start to pile up for the home side but with an inevitability that they will ultimately come to nothing. A tetchy atmosphere begins to develop in the stands. Scott McGowan fizzes a couple of shots seemingly designed to test the bendiness of the Nostell keeper’s fingers but never really threatening the netting. Substitutions are gradually rolled out to no great effect whilst the obscenely fresh faced referee keeps a chummy Blue Peter presenter hold over proceedings. “Come on lads! 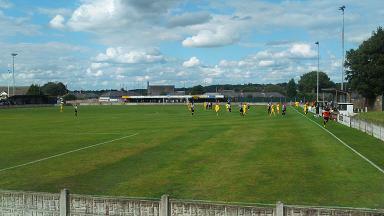 We haven’t started this half!” yells the Nostell goalk eeper at one point, attempting to rouse his teammates on. As he says this there are five minutes left on the clock. Spoiler alert – they never really start. Spoiler alert – neither side does. A replay on Tuesday evening will decide who progresses to the next round. Nostell Miners Welfare only started their F.A. Cup career during the 08/09 season and have never made it passed the preliminary round. 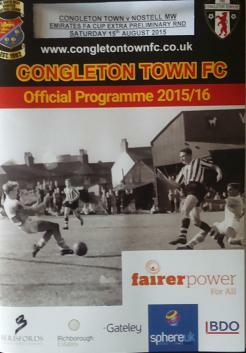 Congleton, with a much longer history in the competition, have only ever made the first round once and that was twenty five years ago. On the display of both teams in this match you would imagine it would be a long time before either gets close to that again. A drab 0-0 draw then. It would seem the Bears are in hibernation. 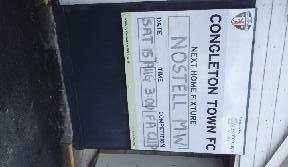 Posted on August 15, 2015, in FA Competitions, FA Cup and tagged Congleton Town, FA Cup, Nostell Miners Welfare. Bookmark the permalink. Leave a comment.